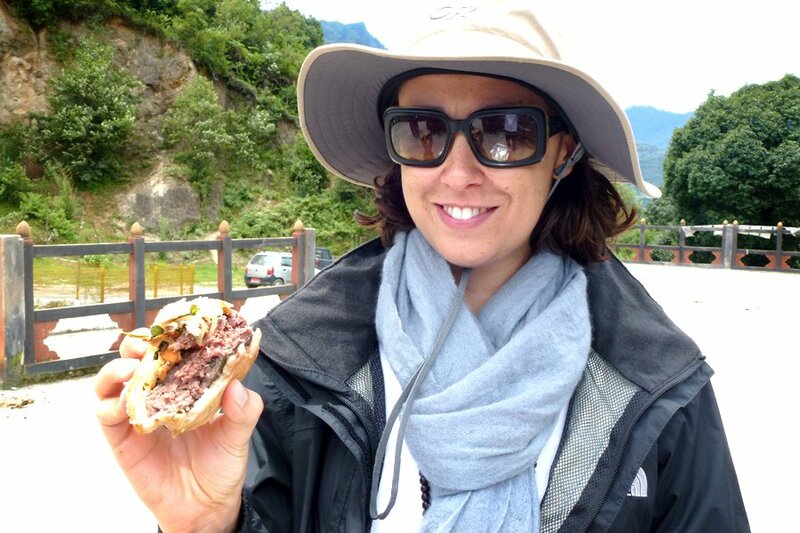 Paula eating a yak burger in Bhutan. Hometown: New York, for the past 20 years. (I was born in Mendoza, Argentina). Favorite destinations: Bhutan, Chile, Bangkok, Argentina. But I'm fickle: My favorite destination is usually my latest trip. Dying to visit: China, Hong Kong, Vietnam, Burma, Finland. Bizarre travel rituals: I always do a mini-facial at duty-free with cleansing lotion and lather on thick moisturizer before getting on the plane. I also try on several perfumes in case the plane smells. Always in carry-on: Anti-bacterial wipes, a neck pillow, two inflatable foot rests, mask, earplugs. See it all or take it easy? Take it easy, focusing on a few things in depth. Drive or be driven? Be driven. Travel hero: My husband James Sturz. He has boundless energy and tries everything at least once but mostly twice. Weirdest thing seen on travels: I saw a man in Vienna chewing on chip wood at a cafeteria, and he wasn't homeless. Best hotel amenity: For a city hotel: a great bottle of red wine at the George V in Paris. For a beach resort: A super stylish straw bag with matching slippers at Cocoa Island in The Maldives. I dream about my meal at Yam'Tcha in Paris. Everywhere I go, I check out the art or paper supply stores. When I arrive in a new place, I learn the lay of the land by taking a walk with a map. I always bring home textiles, bizarre sauces, lots of seeds, beach shells. If I never return to Homestead, Florida, it'll be too soon because everything is fried with ketchup. I travel for the culture.